This mod adds 3 sets of class armors to the game. Do you prefer playing with brute force ? Is your weapon your only answer ? Do you have more muscle then brain ? Using a giant hammer and animal hides, the Berserker strips down all defenses from enemies and pummels them into the beyond. Do you prefer being stealthy ? Attack from a safe distance ? Discover the Archer and his new bows to mow down enemies ! Do you rather feel attracted to the arcane ? Is creating your own unique wand what you want to do ? Is speaking spells and surprising your foes what you prefer ? Discover the Mage and dive into the arcane and alchemy ! how to remove the protection spell ? And it is normal that the mobs do not attack me with this spell? dont use the protection spell ? mobs should still attack you. 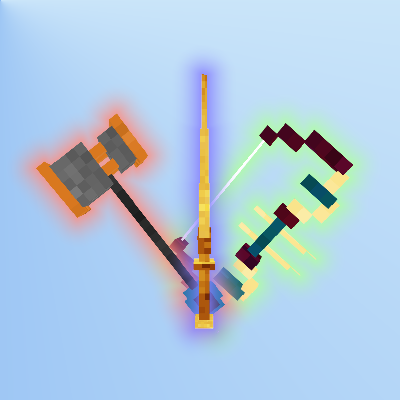 mobs don't attack me, and the spell stays active even without the armor, or with another. Only with these 3 class or with paladin-necromancer too ? Hey Man, I now This Might Be Weird For The Mod But Me Playing Since There Was The 1.5 Versions I Got A Bit Tired Of Wearing The Class Armors Especially The Mage To Get The Abilities. Is There Any Plans For A Future Update Where You Don't Have To Wear The Armor? If Not Is There Any Way That I Can Remove That Without Hurting The Mod? Can't seem to craft any wands. Wearing a full set of mage armor, and crafted a Sensible stick ( from a rabbit foot and gold nugget) and enchanted it with Arcae Affinity. All done in survival, but the wand never transforms..
nice mod, but berserker armor is too expensive, most of the time it's really a challenge to find brown wool, maybe there's a chance to make it possible to craft this armor from any color wool? feel free to edit the .json recipe in your .jar ! perks of 1.12 ! We're looking into it, I can see how brown wool would be harder to make, we just also see that the Berserker class is an easier class to play and in combat, it seems the stronger of the three. However, that doesn't change the fact that it is hard to make, and I believe Subaraki is looking to make all the classes equal. We'll look for a way to balance things out shortly! balancing out all the classes is a big deal, i know that. i've been trying to get a decent balance over time . if you track down the history of the mod, you can see it went trough a lot of changes. I'm constantly (whenever I can) thinking about balancing out the mod. Mostly on what powers each class brings. Just wanted to report a crash that made me laugh out loud when it happened, I used my ragebreaker special on some skellies and it crashed the game :). Banhammer! It seemed like it was lagging before, so it might just be my potato but just wanted to let you know. Ahh just checked, you fixed it already in a newer version, whelp guess I'm trading mystcraft for twilight forest then.